The newest trend in real estate is wellness-oriented developments with active design features, trails and health-oriented programming. There are multiple front desks in the lobby of the sparkling new dual-branded Courtyard Marriott and Residence Inn at Lake Nona southeast of Orlando. One desk is marked for “Stay Well” check-in. Guests in Stay Well rooms get upgraded water, lighting and mattresses, the woman at the desk explains. The rooms also feature a vitamin-infused shower, dawn simulator and air purifier. In short, they are rooms for people focused on health. The hotel is emblematic of a trend in new Florida development and marketing: Wellness-oriented real estate. Each of the 34 Stay Well rooms — it’s a brand — cost about 5% more to build and outfit than regular rooms but fetch an additional 20% in revenue per room, says Jim Zboril, president of Tavistock Development, the hotel’s owner and Lake Nona’s developer. Developers say the public wants wellness. There’s also an element of making a virtue of necessity. Golf, as an amenity to build a residential development around, has declined in appeal. Meanwhile, local governments are requiring significant green space set aside as a condition of approval. 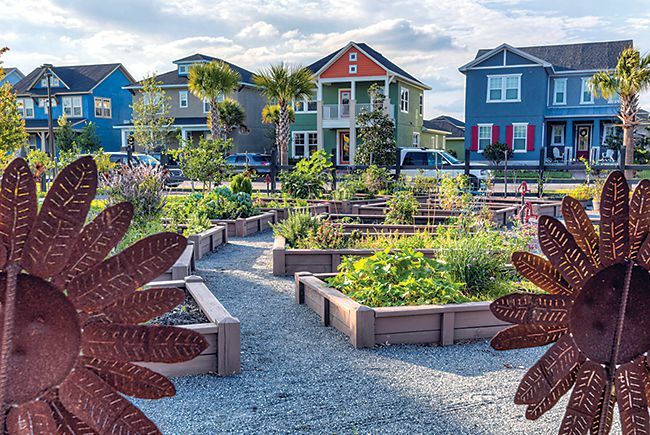 Turn that green space into an active, mar-Ketable amenity by adding trails, and your project stands out in the marketplace. Freehold Communities, a Boston firm, began selling in its 2,600-home Shearwater development in St. Johns County in January and is preparing to open 2,000-home Arden in Palm Beach County later this year. Shearwater has 13 miles of trails and a “kayak club.” There will be a launch area where a resident can put a canoe or kayak into Trout Creek and paddle to the St. Johns River. Arden will have a 200-acre lake and 19 miles of trails. The rear of almost every home connects to a trail or park. Arden sits across from an entrance to the Loxahatchee National Wildlife Refuge and astride a proposed Northeast Everglades trail. In theory at least, an Arden homeowner could throw on a backpack, go out the back door and hike south to Broward or northwest to Lake Okeechobee. “The trail system at Arden is probably the best trail system for a master planned community in America, and I see a lot of them. They’re building fitness and health and wellness into the design of the community. It’s part of the DNA,” says James Chung, president of New York-based Reach Advisors, a strategy, research and analytics firm, which helped Freehold develop its wellness and community-building themes. Rummell says he became intrigued by the idea of wellness as an added value in development.“It may just be me getting older, but I think it’s a universal value,” says Rummell, 70. He hopes to have the $400-million- to-$500-million project under construction by this summer, with residents moving in by the end of next year. It will have 1,170 residential units, plus commercial, retail and park space, a river walk, marina and hotel. “This is going to be healthy living, but you can still get a drink,” he says. Rummell envisions a mix of hard assets and programming to create a place with multi-generational appeal. Hard assets such as a wellness studios and a 125-slip marina will be the easy part. “Exhibit A for unintentional exercise is stairs. By code, we’re going to build elevators, but they’re not going to be the main feature,” he says. The difficult component will be the programming.“Wellness doesn’t mean the same thing to everybody. To some people it’s an intense cycling class, and to others it’s walking with friends. And those are both fine. The devil is in the details, in the execution,” he says. In Aventura in north Miami-Dade County, developer Integra Investments called on architect and designer Bernard Zyscovich for its Aventura Park Square, a seven-acre infill that, as with Rummell’s project, aims to be multi-generational. Zyscovich says “active design guidelines” are a rapidly growing field. “It is something we’re chasing and looking at in virtually every project we’re doing,” he says.Park Square will have retail and office space, condos, a hotel and an assisted living facility. Design elements include wide sidewalks and no curbs so that ramps won’t be needed. Stairs will be prominent instead of elevators. Meanwhile, in Tampa, a joint venture of NHL Tampa Bay Lightning owner Jeff Vinik and Bill Gates’ Cascade Investment will invest more than $20 million in health and wellness at its 40-acre mixed-use project downtown to become the world’s first WELL-certified city district. While certification initially boosts attention to an idea, not everyone sees the need. Zyscovich says he prefers to see worthwhile ideas incorporated into design and into building codes. “I’m not a fan of certifications. It’s a way for people to earn fees to say you’re doing something,” he says. Back in Lake Nona, on a recent weekend afternoon, two men with four kids in tow wait on their combined six bikes for a light to change. “Practice Yoga In The Park” says the sign across the way. Another: “Healthy Living Happening Here.” The suburban development has bike sharing and 44 miles of trails and roads to ride. Residents and workers can opt into a long-term study by Lake Nona and Johnson & Johnson on the link between lifestyle and health. Zboril expects to offer renters a package of wellness features for additional rent and says builders will offer upgrades in water and air purification and circadian lighting in some of the development’s 9,000 homes. The under-construction Landon House apartment building promises a Zen garden. For its America in 2015 report, the Urban Land Institute surveyed 1,200 people and asked them to rank their preferences about how they want to live. 78% — Percentage who would prefer to live in a community with a mix of ages — this held up across income levels and generations. » From 2004 to 2014, participation in aerobic activity increased to 49.2% from 41.7% of the U.S. adult population. » Older Americans are getting more active. The participation rate for those age 75+ was 28.1%. The rate for those 65-74 was 42.4%. Reach says the country is entering an era when older Americans will have a much higher activity level. » The number of people finishing a foot race increased 300% since 1990. Some 18.75 million runners finished in nearly 28,000 events in 2014.